How Can YES Benefit Your Business? How Can Your Employment Solutions Benefit Your Business? 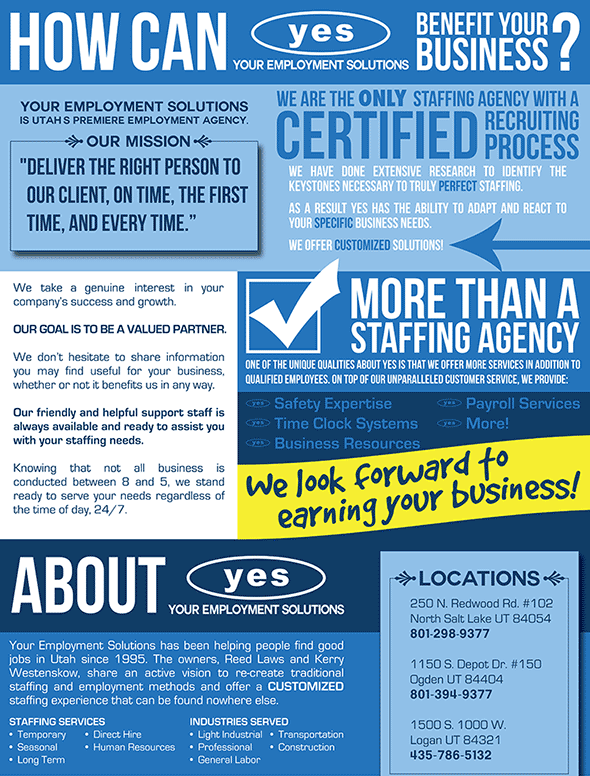 Your Employment Solutions is Utah’s premiere employment agency. Our mission is to deliver the right person to our client, on time, the first time, and every time. Your Employment Solutions is the only staffing agency with an independently certified recruiting process. We have done extensive research to identify the keystones necessary to truly PERFECT staffing. As a result YES has the ability to adapt and react to your specific business needs. We take a genuine interest in a your company’s success and growth. Our goal is to be a valued partner. We don’t hesitate to share information you may find useful for your business, whether or not it benefits us in any way. Our friendly and helpful support staff is always available and ready to assist you with your staffing needs. Knowing that not all business is conducted between 8 and 5, we stand ready to serve your needs regardless of the time of day, 24/7. Your Employment Solutions has been helping people find good jobs in Utah since 1995. The owners, Reed Laws and Kerry Westenskow, share an active vision to re-create traditional staffing and employment methods and offer a CUSTOMIZED staffing experience that can be found nowhere else. P.S. Be sure to visit our Utah job board! Atwater Masonry is tentatively looking into various staffing agencies to recruit for hod tenders and brick layers. Can you tell me more about your requirements for supplying workers please. We can contact you personally, discuss your needs, and determine if we would be a good fit for you. Thanks! Hi, I’m not US citizen and I don’t have US job authorization either, I just have authorization to travel. I’d like to know if you have the option to help me finding an employer who can hire foreing workers. Thank you. Hi Christian, thanks for reaching out. We are unable to help foreign workers get work visas. We do, however, offer employment opportunities to anyone legally able to work in the United States.